Training design: When do you need a branching scenario? A mini-scenario. Make your decision, see the result, that’s it. When should you go to the trouble of designing a branching scenario? Let’s look at some examples. First, you might not need a branching scenario. Most of the time, a one- or two-scene mini-scenario does the job fine. In a mini-scenario, you make your decision, see the realistic consequence, and figure out if you made a good choice. You might then go to a very different scene representing a different situation. Mini-scenarios are great for covering a lot of possible problems, but they’re not so great for getting deep into a more complex situation. For that, consider using a branching scenario. 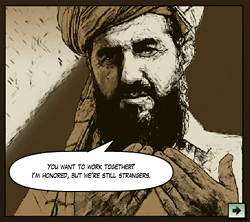 A lot of you are familiar with the Haji Kamal scenario, in which you help an inexperienced Army officer make a good impression on an Afghan leader. You have to make many decisions in one conversation, and things you say at one point affect what happens in later points. I’ve seen cross-cultural training that uses that approach. You’re tossed from one mini-scenario to another so you can practice social niceties. In one scene you accept a business card correctly, and then suddenly you’re eating in a restaurant, and then suddenly you’re deciding what gift to bring to someone’s home. This is surface training. There’s no deep change involved. For the Army, we used a branching scenario because we wanted deeper change. Our (many!) interviews with soldiers suggested that one challenge they faced was their western perspective of “We’re here to help you, so let’s get down to business.” We wanted them to practice recognizing when that perspective was hurting local relationships and, importantly, practice recovering from mistakes. In their “Family of Heroes” scenario (registration required but worth it), Kognito also focuses on just one conversation. Their goal is to help us see from another’s perspective, manage our emotions, and recover from mistakes. Imagine how much weaker the interaction would be if it were instead a series of unrelated one-scene snippets from the couple’s life. 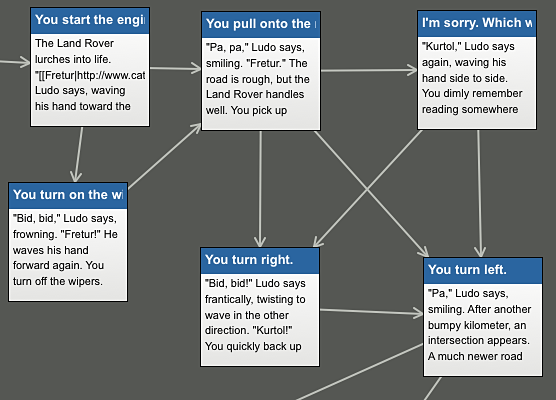 In this fake language learning scenario, the branching isn’t complex. In order to make sense of later scenes, you have to choose correctly in previous ones, and the branches are just little loops to make sure you choose correctly. But because later scenes build on vocabulary learned in previous ones, your learning is repeatedly reinforced, and I hope you also gain confidence. If you want to cover different situations but also want the advantages of some branching, you might present a series of shorter scenarios. One artist’s intriguing Flash interaction uses that approach. You meet three different young people and try to talk them out of killing themselves. Finally, at the other end of the production spectrum, the BBC helps you learn Spanish and Spanish customs with an interactive TV mystery series. All of these use branching to some degree, because their goals include challenging our assumptions and encouraging us to build our own knowledge. While they don’t cover the variety of topics that mini-scenarios could cover, they aim for deeper change. You can see some more branching scenarios on my page of training scenario examples. Joel, thanks for linking to that. I recommend that people check it out. It’s a highly produced video activity that appears to be designed to make you remember the messages through emotional connections to believable stories. The decision points themselves aren’t challenging — as a non-medical person it was easy for me to choose the best answer — but the main goal appears to be using compelling stories to help people overcome motivational and social barriers to doing the right thing. Great post Cathy! I think you’re spot on that there’s a time and place for mini-scenarios and branching scenarios. I would add to your list that branching scenarios are also effective for helping people learn a model, such as Situational Leadership. I think this is true because branching scenarios force you to think about the “why” behind the model. They force you to spend more time concentrating and thinking about which choice is correct based on small nuances. With mini-scenarios, it’s easy to just click the first response that seems correct, because you get an immediate response and can move on quickly. By contrast, clicking through a branching scenario quickly with gut reactions usually means you’ll have to go back and redo the whole scenario. Mike, thanks for your comment. You make a great point about a branching scenario requiring more commitment — you realize that your choices early in the scenario could make your (virtual) life harder later on, so you think more deeply. If we want to provide a bunch of mini-scenarios instead, we might consider ways to create that same commitment, maybe with something as basic as a score. Deb, if you want to develop a branching scenario but don’t have a lot of time, I’d vote for jettisoning high-end graphics and going for a text-based scenario. Then you can use a tool like Twine (described in ) to outline, write, and publish the activity. You might also make sure that any other training design that you’re being asked to do as part of the project is really necessary and wouldn’t be better off as a job aid or a tweak to processes. The goal is to make your training design load as light as possible so you can focus on the activities that are really necessary and will really create a change. I recommend that everyone read this honest blog post that describes the work involved in designing a branching scenario. You can follow the link in the post to try out a substantial demo of the course. Need a Word-based storyboard template for branching scenarios? The NEO STC has just published my “Branching Scenario” template in their newsletter. In addition to just plain being happy about it, I want to help as many people as I can. If you’re looking for a document-based storyboard template, please check this one out! I understand that with a branching scenario, learners will learn from experience. But I fear that I may not have enough opportunity to give feedback and get the core of my content across. Although it would give me great opportunity for feedback at each point, I don’t want to use mini scenarios with feedback after each consequence, forcing the learner to try again until they choose the right option. As a learner myself, I would prefer having the body of content available somewhere in my learning programme. Then I can choose to work through the information first in order to prepare myself for the challenge. Or another learner can choose to dive straight into the branched scenario. [Question 2] Would including a summary of the content as a ‘body of knowledge’ be ok or is this not best practice? 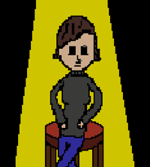 Hi Seretha, if you haven’t already, you might look at my other blog posts on scenarios to get a wider view of what I recommend (click “scenarios” in the menu to the right). I don’t recommend using scenarios to deliver a lot of content. If you’re concerned that you have a lot of information that you’re sure your learners need to memorize, I don’t recommend delivering it through a scenario. I recommend using scenarios to help people practice making decisions, not to get information into their brains. If you think you have to deliver a lot of information, you might first look again at the information and see what’s really necessary. Designers or stakeholders often believe they have to deliver more content than is really necessary, and often the information needed for a decision can be delivered with a simple job aid rather than being presented and explained in the course. Often the creation of the job aid solves the problem without training. 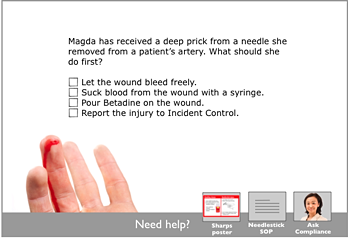 If people need practice using the job aid or reference, then a scenario could be a good choice, with a link to the job aid (answer to your question 2). So, basically, if you find yourself wanting to present a lot of information in the feedback to a decision, you might look at whether all that information really is necessary and really must be memorized (if it doesn’t need to be memorized, you’d put it in a job aid and not the course). If you still find that you have to deliver a lot of information that should be memorized, and you can’t just put it in references, plus you want to explain it in detail, I’d suggest more conventional elearning. Any thoughts on how deep or how many branches a scenario should go? We are doing a tutor e-learning training specifically on open-ended questions. We thought we’d have 2-3 practice scenarios on asking various questions and the tutor (learner) would have to select the right question to ask. So I wasn’t really sure how deep I should recommend the SME to go. The optimal depth for a scenario will (of course!) depend on a lot of factors, including the complexity of the skill you want learners to master, their attention span and tastes, and the amount of development time you have. As a general rule I recommend that each possible path include at least 7 decision points, meaning even if I make a not-great decision, I continue down a path that includes more decisions, including ones that could lead me to a better path, and when I reach the end of the story, I’ve made about 7 decisions at least. In some situations, you’ll want to have short paths that go directly to failure if there are common but egregious mistakes being made by learners in the real world. But most paths in a scenario would be longer, and 7 or more decisions gives you some time to get complex and gives the learners the feeling that they’ve actually done something. The challenge for us as designers is that we’re so deep into the story and we’ve thought through so many possibilities that the scenarios we write look more complex and interesting to us than they do to learners. So I also recommend having a handful of typical learners complete an early draft of the scenario and talk about it with you, so you can get their perspective. It can be useful to do this in a small group, so learners talk with each other and possibly debate things, giving you a sense of how much the scenario is making them think. Thank you so much for the reply!! It is so very helpful. I’m new to the Scenario scene and have read everything you have here. I’m really grateful for your blog! It has helped me grow a lot.